Install Xtento Simplify Bulk Order Processing extension, and you will be able to process orders directly from the orders grid in bulk with the help of more than ten mass actions saving lots of time every day. Create shipments and invoices, add tracking numbers to orders, change order statuses, complete orders, and much more for multiple orders simultaneously via just one click – this is the functionality that every Magento merchant deserves. The module substantially simplifies batch order processing, so it is a must-have time-saver available for both Magento 2 and 1. Invoice Order. This action creates an invoice for each selected order. Ship Order. This one creates shipments. Complete Order. Via this command, you set order status to “Complete” in bulk. Capture Payment. Capture payments for all selected invoiced orders rapidly. Invoice / Ship Order. This one executes two actions simultaneously: “Invoice” and “Ship”. Invoice / Ship / Complete Order. The previous command + “Complete” action. Print Order (Invoices / Packing Slips / Credit Memos / Shipping Labels / All). Print the related PDF documents after running one of the above actions. Delete Order. Delete orders in a matter of seconds. Note that this action can be applied to orders with the “cancelled” status and no associated shipments/invoices/credit memos. Set Order Status. This command changes the order status to any custom order status. (Re-)send email to the customer. Send or re-send order, invoice or shipment email to notify customers. Uncancel Order. If order status is “Canceled”, this command changes it to “Processing”, so the order can be invoiced/shipped. Furthermore, Xtento Simplify Bulk Order Processing for Magento 2 and 1 allows you to add tracking numbers to shipments when shipping several orders simultaneously. In case you have to deal with already sent orders, a tracking link for tracking the order is shown instead. It is also necessary to mention that there is no need to show all the specified actions in the drop-down. You can disable specific actions focusing on the ones you currently need. Let’s have a look at a regular grid with orders. After installing Xtento Simplify Bulk Order Processing it looks almost the same, but you get the ability to enter tracking numbers right from the grid. Besides, there are many new actions available. 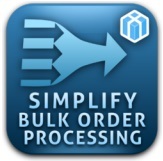 Now, let’s go to System → XTENTO Extensions → Simplify Bulk Order Processing. All settings here are divided into the following sections: General Configuration, Extension Configuration, Order Status Configuration, and Grid Configuration. In the first section, the server name is displayed. Besides, you add a license key here and enable or disable the extension. In Extension Configuration, you can select multiple actions that will be displayed in the grid drop-down. Besides, it is possible to activate the following two features: Capture payment for invoice and Set invoice status to paid. 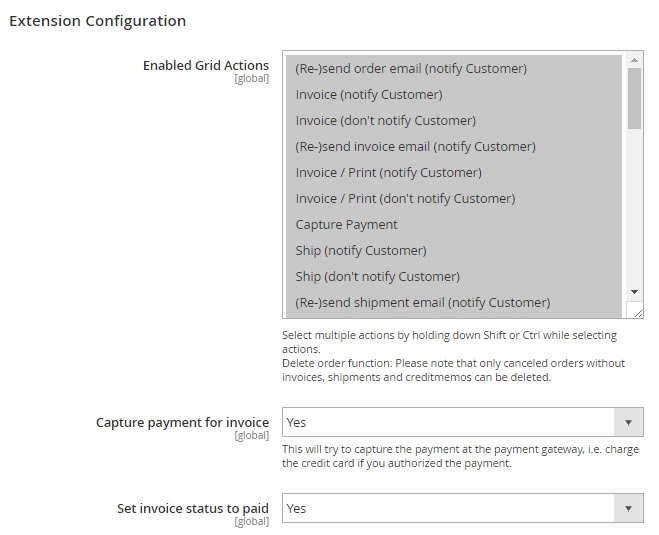 Order Status Configuration lets you select order statuses to be set automatically after invoicing, shipping, and completing the order. Grid Configuration allows you to add tracking numbers to already shipped orders automatically, and choose default tracking carrier. As you can see, the Xtento Simplify Bulk Order Processing extension is admin-friendly and intuitive, and at the same time powerful. 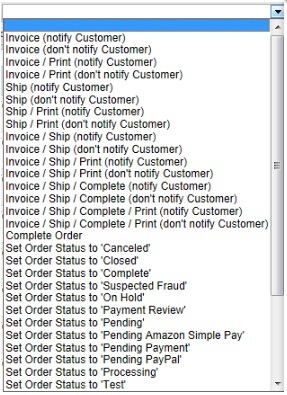 Ten new mass order actions in the order grid: “Ship order”, “Invoice order”, “Complete order”, “Change order status”, and more. Fast order processing in bulk. Bulk invoice and bulk ship orders right from the grid. 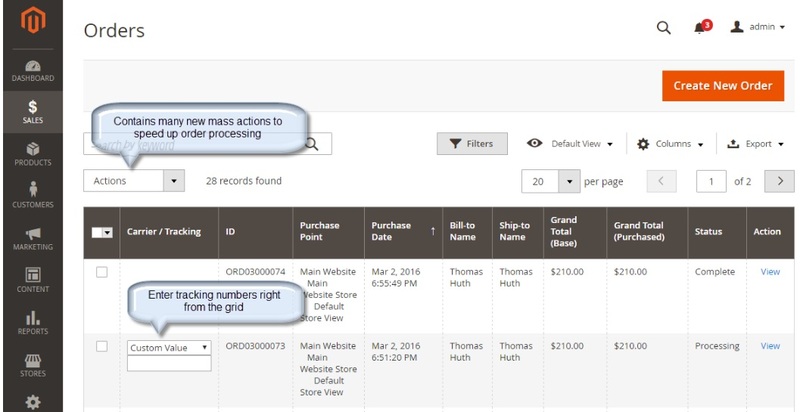 Add tracking numbers in bulk when shipping from the Sales > Orders grid. Combine carrier/tracking number input fields into a single column. Carrier and tracking number link on the Sales > Orders grid. Print PDF documents in bulk. Admin-friendly customizations (show only necessary actions). Custom order status can be set automatically. 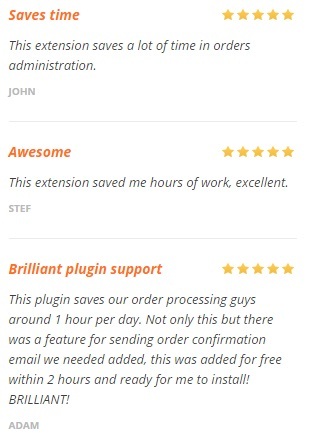 Xtento Simplify Bulk Order Processing is a great time-saver that significantly enhances the default functionality of both Magento 2 and 1. By adding new actions to the order grid, it dramatically simplifies the default admin routine. What is more, the extension costs only $99, which is a very reasonable price.